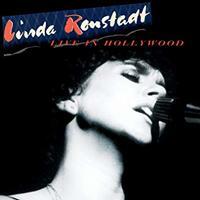 Live concert Linda Ronstadt recorded in 1980 for HBO TV special! Live In Hollywood features amazing performances from a concert that Linda Ronstadt recorded in 1980 for her acclaimed HBO television special. Recorded on April 24, 1980 at Television Center Studios in Hollywood, and produced by John Boylan, the concert captures Ronstadt at the peak of her reign as America's most popular female rock singer. For Live In Hollywood, Ronstadt selected 12 of her favorite performances from the original concert. In concert, she was joined by an outstanding band that included guitarists Kenny Edwards and Danny Kortchmar, drummer Russ Kunkel, bassist Bob Glaub, keyboardist Billy Payne (of Little Feat fame), pedal steel guitarist Dan Dugmore, and backing vocalist Wendy Waldman. Rounding out the band was Peter Asher — Ronstadt's producer and the concert's executive producer — who played percussion and sang background. On stage, Ronstadt held the packed audience spellbound with powerful renditions of her biggest hits — "Blue Bayou," "Poor Poor Pitiful Me" and "It's So Easy" — plus an incredible, previously unreleased six-minute jam of her No. 1 smash, "You're No Good." The concert also showcased a trio of Top Ten hits from Ronstadt's then-current album — Mad Love — with performances of "I Can't Let Go," "How Do I Make You" and "Hurt So Bad." After its release in February 1980, Mad Love would become Ronstadt's seventh consecutive platinum-selling album.